Laser Hair Removal is available at Canyon Laser Skin Care for patients looking to eliminate unwanted facial and body hair - for both men and women in North Vancouver. Laser hair removal using Intense Puled Light offers a quick, safe and comfortable way to eliminate unwanted facial and body hair for men and women. Not all hair removal devices are created equal. With an array of technologies available today, it can be confusing to choose a provider for your hair removal procedures. At Canyon Laser Skin Care we use Intense Pulse Light (IPL). Because not all hairs sit at the same depth, this technology allows us to use several filters and pulse durations to target different depths and sizes of the hair follicle, providing consistent, safe and quick results. Lasers can only penetrate to one depth in the skin which only targets one type of hair. The quality of hair varies from fine, medium and course on our body – the different types of hairs are situated in various depths of the skin. Being that lasers only penetrates to one depth, it cannot address varying hair types. IPL can, as different wavelengths of light can be customized to target the hair type to be treated. The patented technology transcends the older, painful hair removal lasers to deliver long-lasting results. What are some areas that can receive hair removal treatment? Most commonly treated areas for unwanted hair are the face, legs, back, arms, chest, bikini and underarms. How many laser hair removal treatments are required to see results? The number of treatments you may require for optimal long-term benefits depends on the area you wish to have treated, the hair density and your hair’s growth cycle. Your hair grows in cycles and many factors influence its growth. Age, ethnicity, weight, hormones, diet, medication and metabolism all play a part in your hair’s location, thickness and resilience. IPL slows the growing capacity of follicles in the growth cycle at the time of treatment. Since some hair follicles may enter their growth cycle after your treatment, four to eight treatments may be required to deliver optimal results. Sessions are spaced four to ten weeks apart, depending on the area treated. How does laser hair removal treatment feel? No anesthesia is required due do to the systems internal cooling. The top layer of the skin is protected and pre-cooled prior to each pulse. Most patients describe the sensation similar to the quick snap of a rubber band making it the preferred choice for hair removal. Treatments can take 15 minutes to 1 hour depending on the size of the area treated. Are you a candidate for IPL hair removal? More advanced than even lasers, IPL is the first photo-epilation technology proven to treat unwanted hair safely on most skin types and hair colour. During your consultation, your goals, skin type and hair quality will determine your suitability for hair removal and the optimum program for you to achieve the best results. 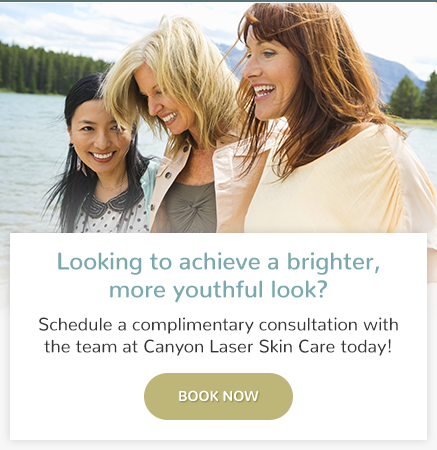 Canyon Laser Skin Care was established in 2008 and since then we have treated thousands of patients. With our vast experience and knowledge, we are able to focus on safe and effective treatments.